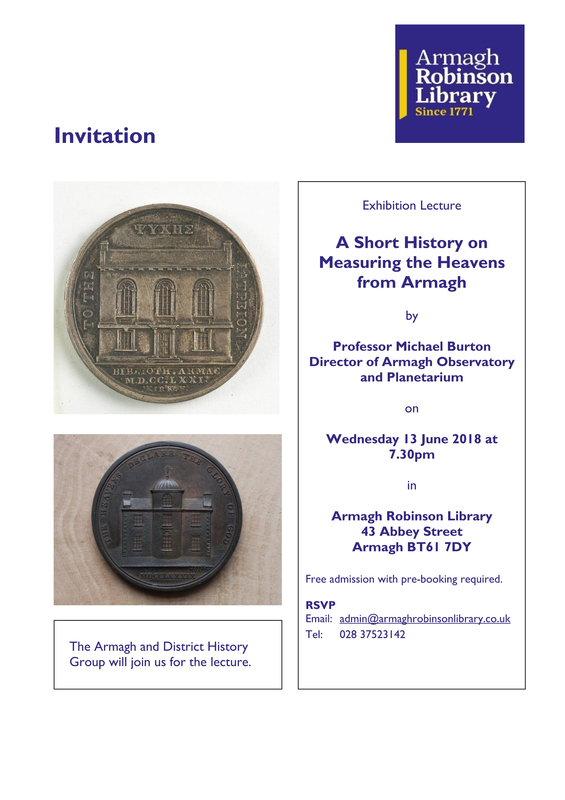 The title is A Short History on Measuring the Heavens from Armagh and it is by Professor Michael Burton, Director of the Armagh Observatory & Planetarium. Members from the Armagh and District History Group will also be there. It is on Wednesday 13 June 2018 at 7:30pm in Armagh Robinson Library, 43 Abbey Street, Armagh BT61 7DY. Admission is free, but pre-booking is required. You can pre-book via email at admin@armaghrobinsonlibrary.co.uk or by phone at 02837 523142.